2. Break the eggs into the well. Gradually mix the egg mixture into the flour using the fingers of one hand, bringing the ingredients together into a firm dough. If the dough feels too dry, add a few drops of water; if the dough feels too wet, add a little more flour. Note that you don’t want to add too much flour or your pasta will be tough and taste floury. 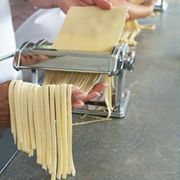 3.Knead the pasta dough until it’s smooth, 2 to 5 minutes. Lightly massage it with a touch of olive oil, tuck the dough in a resealable plastic bag, and let it rest at room temperature for at least 30 minutes. The pasta will be much more elastic after resting than it was before.